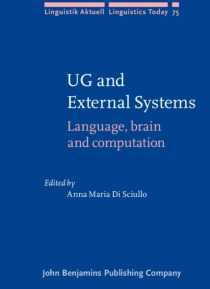 This book explores the interaction of the grammar with the external systems, conceptual-intentional and sensori-motor. The papers in the Language section include configurational analyses of the interface properties of depictives, clitic clusters, imperatives, conditionals, clefts, as well as asymmetries in the structure of syllables and feet. The Brain section discusses questions related to human … learning and comprehension of language: the acquisition of compounds, the acquisition of the definite article, the subject/object asymmetry in the comprehension of D-Linked vs. non D-linked questions, the evidence for syntactic asymmetries in American Sign Language, the acquisition of syllable types, and the role of stress shift in the determination of phrase ending. The papers in the Computation section present different perspectives on how the properties of UG can be implemented in a parser; implementations of different theories including configurational selection, incorporation, and minimalism; and the role of statistical and quantitative approaches in natural language processing.